Relate: I failed today. Every single one of my 340 students I love in their own unique way. There is no greater blessing for me than to sit with one of the kids during a break and just pour favor and attention on them as they try in their broken English to show me a toy or a drawing or their new haircut or whatever. I love them all, but I can also just as honestly say I do not love every class. Those students are broken into seventeen classes of about twenty students that I teach once a week. I have four each of first through third grade and five classes of fourth graders. Some of those classes, like 4C, I can’t wait to get in there and teach. They make my job fun. Other classes, like 4D, I dread going into. There are some classes that are on again, off again. There are good days and there are rough days. I have not had a good day yet with 4D. I have tried the carrot, I’ve tried the stick. I’ve tried every classroom management technique I know. I can honestly say they keep me sharp because I am constantly researching to try and find something that can help me turn the corner. As soon as I said it, I wanted to eat those words. In third grade I was a little demon. I had a first year teacher and on a fairly consistent basis I took her to the edge of her sanity. I am absolutely certain I deserved it, but it still cut like a knife when she shouted the exact same thing. I can still picture the classroom, the desk I was standing behind, and where she was in front of the chalkboard when she said, “Will you shut up, already! Can’t you do anything right?” Those words have scarred me, and today I passed them on to eighteen more students. React: James said that humanity has been and will be able to tame all kinds of animals and even large vehicles that we can direct from a very small control center, but no one will be able to tame the tongue. 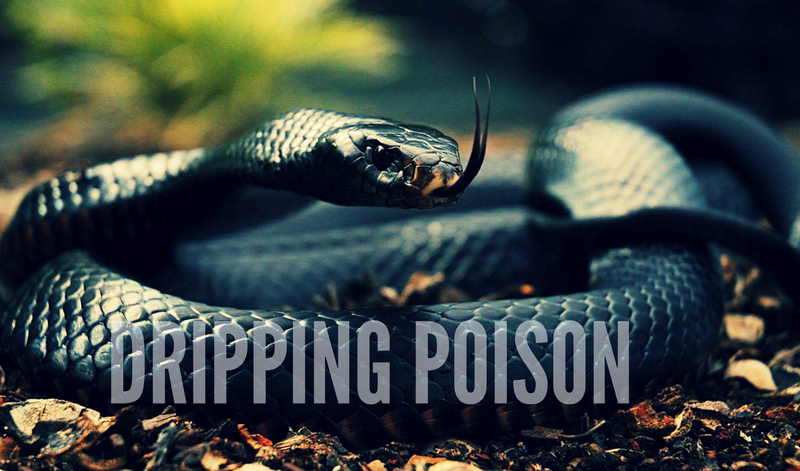 He calls it a restless evil full of deadly poison. I can picture a snake curled up just swaying back and forth watching for a moment to strike. Then, before anyone has a chance to react, it lashes out striking its victim. Sometimes I feel like that is the way my tongue works. I think everything is OK. Everything seems still, then in one reckless moment that tongue is jumping out of my mouth to inflict its venom. Jesus said that one day we will have to give an account to every careless word we have spoken. How many times have I lashed out, ruining everything? How many times has a careless comment or observation been poison dripping from my mouth that I am not even aware about. One day, when I stand before God and give account, will I be able to see the scarring my words have caused from the perspective of the victims to whom they were directed? Are we being good and godly representatives of Christ with what we say? When we speak, do people know we are Christians by our love? Help me, please. I am desperate for Your wisdom and Your discipline because on my own there is absolutely no way I could ever control my tongue. At the most unexpected of moments, over and over again, bitter poison drips from my mouth ruining everything within earshot. Forgive me for my failure. Protect the ears and the minds of my victims. Help me to be more aware and more controlled in what I say. Let my words speak life and bring glory to You with every single utterance. I’ve been there, Beejai. That is why I retired from teaching high school English. I realized that I could not guarantee not losing it when students pushed certain buttons. There are times – for everything – a time for silence, a time to be heard. Evil prospers when good women & men remain silent. Great post, very challenging. It’s certainly a horrible feeling when those words slip out, thankfully our God is a God of grace. Amen. That’s what keeps us going – His grace. Praying for you and every teacher who is going through the same struggle. I’ve been there, and after a year of teaching 13-14-year old kids I vowed to myself I would never do it again. I salute teachers who can teach elementary and high school kids because I know I cannot do it. Yes, we are always learning about our own sinfulness and our need of a Spirit controlled life. I think often on the verses in James-how our tongues are a small member but set the whole forest on fire-we can never recall our words but we can trust the God of grace to heal the wounds we sometimes cause with them. Thank you for this reminder to be careful with my words because every word matters. You have all my sympathy! It is so difficult! Only those who have never taught high school, can smugly insist that they would do better than this! May God give you patience, peace and discernment in your vocation. My vocation is to be a follower of Jesus and a writer. Teaching is just how I pay the bills. I love it, but it is not my life’s work. Of course, I completely understand this, but you do understand that one cannot possibly consider teaching young children as a mere job. Whether we like it or not, it does become a vocation. Maybe temporary, but for those children, you are their teacher with no buts or ifs. I partially share the same vocation with you (together with others, hence partially) and at a certain point I just gave up teaching because I did not have the patience and love to do it right. I just could not bear doing something wrong to them because I would be engaged in other tasks, hence not that patient or committed to them. I am not sure if you can understand me but what I am trying to say is that teaching, even if it is not our vocation per se, is a vocation on its own and we can never escape its implications no matter what. Again, let me repeat how much I admire your courage. It is so difficult what you are doing! May God bless you! Oh, I certainly understand you. You have a hard job. Be gentle with yourself and thank you for all you do. *hugs* Been there with you when words we would never say in our ‘right mind’ just burst from our lips in a fit of emotion. Thank God we have a gracious Father who never loses control and who forgives and restores. I know my tongue is the least controlled part of me and I need to daily remember I no longer live but Christ lives in me and that includes my tongue. Forgive yourself, and keep offering your words to God, he can redeem anything. Teaching is HARD. But if you haven’t already, it is never too late to apologize to 4D and ask their forgiveness, they may reject it, but you are already totally forgiven, and it may even soften their hearts to see your humility. It is hard though but totally worth it. I think Jesus is right to describe our words as a reflection of our hearts…We can no more perfect them than we can perfect our own souls. If we could, we would be in no need of saving grace. It is Jesus Himself whose indwelling gives us so much patience, grace, peace that is not our own. 🙂 Hard lesson though. How many words have echoed through my ears that I can’t believe have come from my own mouth…from my own heart. My words (and the words that don’t make it out of my mouth) indicate to me when I need to sit and spend time with Jesus and sort through some things. Thanks for writing! Because of where I live and what I do email isnt always the secure form of communication it might be in the States. The email associated with this name isnt even accessable to me. I want to offer support in your teaching time, Beejai; I was an elementary teacher for over 20 years – mostly 4th grade. It was my passion. Before class each day, I would pray, and ask the Spirit to take me over. I would also pray over every desk that each student might desire to learn. The thing is, you gotta be Jesus to them. Especially at that age, it’s not about the content, it’s about meeting each student where they are as they come to you each day. It’s about offering them love and grace, and once they are filled, they will be ready to ingest the content. Yes, I know there are parent and administrative expectations, but truly they need you to see them, down into their heart – as Jesus would. Once you do that, they will open their hearts and minds and desire to learn. It’s a long journey you’re on with some kids – it’s discipling. Please don’t make teaching a “have to.” If you approach it as a ministry with all the love and grace you have, it will transform not just the children, but you as well. I love your blog, read it regularly, but seldom comment. This one, though… yeah, I needed to comment. Um, I know everyone here (and certainly I, myself) have done that in one form or another. Humanity, carries with it this whole bag of “frailties”… and impatience, and fatigue, and temper are definitely in the bag. But you MAY be able to take a moment in the next class, go back to your own moment of frustration with them, explain WHY you get so frustrated (because you care for them and want them to learn, and you’re frustrated (more with yourself) for not having found the means to connect, yet… and even share that memory of your own “wounding”. You can open that vulnerability to them, and transparently share that you simply refuse to do that TO them. I’m not sure if such a conversation is possible in English there, whether these concepts are in the vocabulary you’ve taught. But I know, that for myself as a child, I developed huge respect for those adults who didn’t try to “play perfect/omniscient” in my life, but apologized and reconciled when something was wrong. Just a thought… perhaps our stumbles provide God’s grace opportunity to redeem the moment into something spectacular! Just a thought… My blessings and prayers go with you always! Grace to you! Your honest sharing with us and with your students is a lesson in itself. I have a feeling those words will create further conversation between you and your students in the weeks to come. You have an awesome and challenging profession that not many are blessed or equipped to do. Over the years, you will touch many lives and hearts! I read and love your blog too. Teaching sounds like an awesome responsibility. Encouragement to you in both your career and your ministry, in whatever ways they may coincide. Yes. Just because I acknowledge a failure doesn’t mean I wallow in it. The more you connect to silence of your inner being…silence Jesus talked about, the more the tongue goes silent and in control…The more you try to control it, the worse it does.. There is also the opposite problem. Holding in what you want to say, and develop ulcers. Isn’t the forgiveness of our God awesome though! We make mistakes, but they aren’t the end–if we just go to Him. I taught at-risk students at the high school for 25 years, all day long. It was difficult not to lose it a few times. But bringing it back to them and discussing why I did and what their part might have been in that, an honesty with students and anyone, can really be a good learning and even bonding experience. You and I are human. They can relate to that. with ‘failure’ there is much to gain, for one without the other there would be neither.